Meet your favorite four-legged friends & discover their superpowers! Meet the super-powered dogs in our community during Superpower Dog Day on April 28! Watch search and rescue dogs practice their life-saving skills, discover the science behind these talented canines’ sense of smell and even give a superhero dog a high five! Superpower Dog Day is the final celebration of Orlando Science Center’s super-powered, super cool, Superhero Science Month. Here are just some of the highlights of this paw-sitively spectacular event! Meet real search and rescue dogs from Search and Rescue Central Florida and see them in action in DinoDigs. Make your own recycled dog toy in The Hive: A Makerspace. Learn about Superpower Dog noses, how & why dogs search for a human scent, & the effect of weather & terrain on a dog's scent. Learn what to do if you get lost outside & how best to help a search dog find you! Meet Florida Task Force 4 and learn how disaster search dogs are trained. Don’t forget to see our newest film, Superpower Dogs 3D, and follow the lives of five dogs that are saving lives and helping people across the world. This remarkable event is a reminder that every dog has the power to be super! Become a conservation hero this Earth Day! From upcycling your old items to being a friend to animals, there’s no limit to what you can do. Celebrate Earth Day on April 22 with these 10 creative and exciting ways to have fun while protecting our planet. Upcycle water bottles – Recycling your plastic water bottles is great. Upcycling them to become planters is even better! Simply cut off the top of your water bottle to any height you desire and you’ll have the perfect vessel to hold your soil and plant. Make it an art project by painting and decorating your new planter. Upcycle newspapers – Did you know that 69% of newspapers are thrown away every day? Instead of tossing your newspaper after reading it, make some beautiful and functional decorations for your home. All you need to make unique coasters for your table is a newspaper, raw spaghetti strands, and a quilling tool. Upcycle glass jars – Turn your used sauce and salsa jars into storage containers! Simply wash them out with soap and water, and let your imagination do the rest! From making a piggybank to a makeup brush holder, the possibilities are endless. Create recycled projects in The Hive: A Makerspace – Join us at Orlando Science Center in The Hive: A Makerspace. It’s the perfect place to unleash your creativity. Make custom embroidered patches and turn someone else’s trash into your treasure at our Embroidery and Recycled Art workshop. Or become a friend to bees by making a bee house out of wood scraps in our Bee House workshop! Check out our upcoming workshops in The Hive here. Watch for wildlife when driving – Take the extra moment to look for wildlife that may be crossing the street when you’re driving. Be aware that animals like squirrels, armadillos, opossums and deer tend to run across the street, especially near wooded areas. Leave water out for animals – As temperatures start to rise, it’s important to give your backyard neighbors as many sources of water as possible. A bird bath can look lovely in your yard and provide water for birds, squirrels and deer. You can also simply leave a bowl of water in the shade to help many other animals stay refreshed. Carpool to work or school – Take a break from using gas every day by sharing driving responsibilities with a colleague or classmate. Carpooling not only reduces your carbon footprint, it also saves you money and gives you a travel buddy during your morning commute. Pick up litter at the beach – Make it a goal to pick up as much litter as possible during your next beach day or outdoor adventure. Make a competition out of it—whoever picks up the most litter wins! Plant a garden – Flowers and other plants won’t only make your home look even more beautiful, they’ll also help the planet! By putting more plants in your yard, you can attract species like butterflies and bees. These pollinators will help keep your garden and other wildlife in your community healthy. Bike to your local destinations – Reduce your carbon footprint and support your health by riding your bike instead of driving! Feel good from the rush of endorphins that comes with exercising and knowing you’re helping the environment. On Thursday, April 4, PNC Bank celebrated 15 years of their commitment to early childhood education through the Grow Up Great program in Orlando Science Center’s KidsTown exhibit. PNC staff brought the Mobile Learning Adventure (MLA), a traveling exhibit that provides an opportunity for parents and caregivers to learn about the importance of early childhood education while having fun with their children. 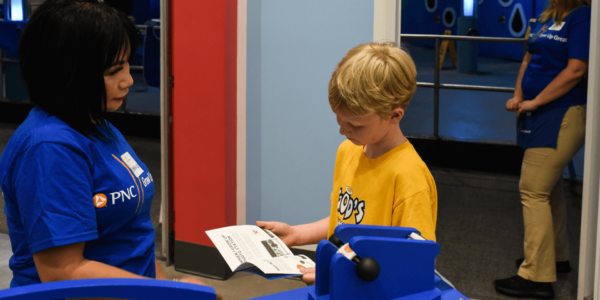 The educational exhibit allows parents and children to engage in unique, interactive activities — whether visiting a learning kiosk, imagining the future, or exploring the difference between a need versus a want. It's a great way to discover how everyday moments are learning opportunities. The hands-on exhibit offered educational games for children and their parents on two touch-screen kiosks. Activities included the “When I Grow Up” station, where kids dress up as different professionals and have their picture superimposed on an appropriate background. In addition, parents took home an activity book and a Sesame StreetTM learning kit created for PNC as part of a continuing partnership. The kit included a magazine for parents and caregivers, children’s activity cards and a book, along with an original Sesame Street DVD that demonstrates how to take everyday moments and turn them into learning opportunities. Congratulations to PNC on 15 years of Grow Up Great! Orlando Science Center is proud to be a partner with PNC Bank on early childhood learning initiatives. Grab your capes and masks! Orlando Science Center is transforming KidsTown into a superhero metropolis for Superhero Week from April 11 to 14. Power up with heroic crafts, games, stories and more and discover what makes you super. Don’t forget to wear your own family-friendly superhero costume! Join us on Saturday for special appearances from legendary superheroes, and you just might become their next biggest ally. Unmask your inner hero with these super activities. Crafts – Show off the power of your creativity with a different set of superhero-themed crafts each day. Crafts include making your own superhero mask, headband, shield, comic books, and more! Games – Strength comes in numbers! Work together with your fellow heroes to discover everyone’s unique abilities that will help you defeat evil. Stories – Join us for Superhero StoryTime and find out what it takes to be a superhero! Superhero guest appearances – Join us on Saturday to meet your favorite superheroes that have saved the world with their bravery and powers. All Superhero Week activities are included with general admission to Orlando Science Center which is free for members, $20.95 for adults, $18.95 for seniors and students, and $14.95 for youth (ages 3 – 11). Tickets include access to all four floors of exhibits, giant-screen and 3D educational films, and live programming. Leaders from science centers and museums from around the state are planning to join Orlando Science Center to celebrate Florida’s future of technology and innovation during STEM Day at the Florida Capitol on April 16, 2019. The goal is to engage legislators about the importance of STEM (science, technology, engineering, and math) education and to highlight the critical role that Science Centers play in inspiring and creating the STEM workforce of tomorrow. Participants will be stationed inside and outside the Capitol building with experiments, simulators, robots and more! Throughout the day, state legislators will take part in hands-on activities while learning how STEM education helps grow Florida’s technological workforce. STEM has evolved to become a critically important topic in education and industry. Therefore quality STEM education is more important than ever. Technology and scientific innovation are the driving forces of our society with great impacts on the economy and our standard of living. America’s standing in the global marketplace has depended upon being able to compete with other nations in scientific and technological development, and success requires an educated youth base and a talented workforce. In recent years, less than one-third of university students in the United States have chosen to pursue a STEM field. Boomers are retiring and creating job vacancies, but colleges and universities aren’t producing enough STEM graduates to fill those roles. As a result, it is projected that the U.S. might be short as many as three million high-skilled workers in the near future. Partnerships among museums, science centers, educational institutions and industry provide opportunities to engage youth by bringing STEM subjects to life. By presenting the real-world applications of STEM skills in visual and dynamic ways, students can be inspired to pursue further education and ultimately careers in STEM fields. And regardless of the field they enter, tomorrow’s innovators will need strong skills in problem-solving, critical thinking and teamwork to be successful. These skills are reinforced through active, challenge-based activities offered at informal learning environments like museums and science centers. Great Bear Rainforest is now playing in the Dr. Phillips CineDome! Run wild with the magnificent creatures that were once thought to be a myth! In Great Bear Rainforest, discover spirit bears, the captivating white-coated North American black bears that have fascinated indigenous people and scientists alike for centuries. Although these bears may look like polar bears, this giant-screen film takes place in the wild coastal islands of Canada. Journey with the spirit bears, sperm whales, wolves, sea lions, and countless other species that call this uncharted land home. With rare insight into the lives of the First Nations people that share a home with these creatures and the contributions of guest narrator Ryan Reynolds and screen composer Hans Zimmerman, Great Bear Rainforest brings these never-before-seen wonders to life. With so much to learn about one of the last wild places on Earth, we broke down the top five facts you need to know before seeing the film. What are spirit bears? These magnificent animals can only be found in the Great Bear Rainforest, where one in 10 of all bears are white. They get their beautiful color from a rare genetic trait. Although indigenous people have protected them for centuries, it wasn’t until the 20th century that scientists even discovered these bears. Filming took three years, but was 30 years in the making – Ian McAllister, the director of this stunning film, has called the Great Bear Rainforest home for quite some time. For over 30 years, this award-winning author and photographer has documented and advocated for the protection of the Great Bear Rainforest. First Nations People supported the production – This film couldn’t have been made without the permission, knowledge and guidance of the First Nations people that have been living in the Great Bear Rainforest for centuries. You’ll become inspired by the moving stories of the next generation of young leaders beginning their lifelong journey to protect the rainforest. This film is about more than the bears – Don’t let the name of the film fool you! Great Bear Rainforest focuses on the incredible journeys of many fascinating creatures that roam the land and sea. Dive into the deep blue with sperm whales, run with wolves, play in the coastal waters with sea lions, and even join a feeding frenzy with humpback whales. It has a star-studded production team – A project as exceptional and exciting as Great Bear Rainforest attracted some of the most talented and celebrated people in the film industry. Enjoy poignant and humorous narration by Ryan Reynolds, an award winning-actor and avid environmentalist. Become immersed in the story with a breathtaking score by Hans Zimmerman, an award-winning composer who has scored more than 120 films. Feel the dedication and love put into every part of this film by the incredible production team. Great Bear Rainforest is now showing in the Dr. Phillips CineDome at Orlando Science Center. Please pick up a daily schedule upon arrival for show times, or click here for our online theater schedule.